Libraries in the Digital Age (LIDA) is a biennial international conference that focuses on the transformation of libraries and information services in the digital environment. It was held 16 - 20 June 2014 in Zadar (Croatia). The main theme of LIDA was "Assessing libraries and library users and use" which was realized through many presentations, workshops and posters. This report highlights the sessions which the authors attended, and which are related to their research interests. In recognition of evolving social and technological influences that present both challenges and opportunities, "Assessment" was the theme of LIDA 2014. The conference theme was divided into two parts; the first part addressed advances in qualitative assessment methods and practices, and the second part covered assessment methods involving alternative metrics based on social media and a wide array of communication activities, commonly referred to as altmetrics. 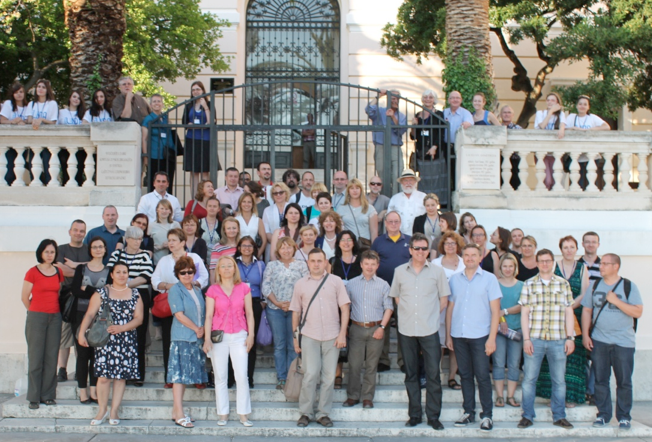 The LIDA conference was held 16 - 20 June 2014 in Zadar, Croatia. The total number of participants was 109. Sixty presenters represented 21 countries, 27 presenters were from Croatia, and 22 were students of library and information sciences. Thirty-four papers were presented by 75 authors, including a Guest of Honor and 7 invited speakers. Three Ph.D. students participated at a Ph.D. Forum sponsored by ASIST. There were also four workshops held during the conference, and 19 posters were presented by 32 authors. LIDA was organized by Tatjana Aparac-Jelusic, Ph.D. (Department of Library and Information Science, University of Zadar, Croatia) and Tefko Saracevic, Ph.D. (School of Communication and Information, Rutgers University, New Jersey, USA). This report focuses on the sessions which the authors attended and which are related to their research interests. Additional information can be found on the conference website. The first part of the LIDA conference was dedicated to qualitative methods in assessing libraries, users & use: applications, results. It was chaired by David Bawden, Ph.D. (Centre for Information Science, City University, London). The goal of this part of the Assessment theme was to explore efforts, concepts, and results in using qualitative methods in assessing library impact, value, effectiveness, and use of new and old services. Qualitative assessment results may improve library services and encourage more effective use by a variety of users in evolving technological and social environments. The conference was opened by Dr. Bawden with a keynote entitled "'The noblest pleasure'? : on gaining understanding from qualitative research in library/information science". In his presentation he emphasized the relationship between qualitative and quantitative methods in the library and information sciences, arguing that they can be combined. Furthermore, Bowden gave interesting examples of this mixed methods approach in natural sciences. Invited speaker Elke Greifeneder (Royal School of Library and Information Science, Denmark) gave a presentation entitled "Big data does not equal big picture", showing how some trends in information behavior studies are affecting data gathered, and providing examples that show that interpreting the results of online interviews and case studies do not always lead to correct conclusions. The "big picture" is therefore not always the "correct picture". The title of the presentation prepared by Ross J. Todd and Punit Dadlani (Rutgers University) was "Collaborative information use by high school students in a digital learning environment." Illustrative findings of their study showed that students valued the affordances of group work in relation to knowledge creation, learning outcomes, division of workload, learning equity, collegiality and cooperation. Ross addressed the concept of 'Social Justice' that emerged from the data gathered, which is an important factor that needs to be taken into account in the planning of collaborative tasks. Sanjica Faletar Tanackovic, Darko Lacović and Gordana Gaso (University J. J. Strossmayer, Osijek, Croatia) presented results of a qualitative study, an unobtrusive observation of study spaces in an academic library, which revealed that students' predominant activities in a quiet study room were reading, taking notes and using computers for academic purposes (e.g. MS Office) and relaxation (Facebook, Twiter etc.). As a result, the library improved some spaces and services (larger tables, higher number of computers) to better support the documented student work behaviors. Invited speaker Donald Case (University of Kentucky, USA) emphasized recent growth in measures of information outcomes, presenting a content analysis of samples from 62 years of information behavior studies, and giving suggestions about the development of new measurement types. These insights can be very useful in undertaking further investigation of human information behavior. Guest of Honor Professor Gary Marchionini (Univeristy of North Carolina at Chapel Hill, USA), gave a presentation titled "Libraries and literacies: from I to we". He explained how libraries can "collect people" by helping them to properly manage their various lifetime profiles and cyberidentities, such as electronic health records, personal genome, digital identities (e.g. passwords), electronic learning records, and financial profiles and credit reports, gathered from sources such as Google Scholar, MS Academic, ResearchGate, and Klout, by using identity trusts to make "tie networks" and to facilitate reading and writing. The speaker showed how libraries can serve many different groups of people. The second theme of the conference, chaired by Blaise Cronin, Ph.D. (School of Informatics & Computing, Indiana University, USA), covered assessment methods involving alternative metrics based on social media and a wider array of communicative activities, commonly referred to as "altmetrics." While qualitative methods have a long tradition of application, altmetrics are a set of new approaches to filtering information and to evaluating scholarly communication and research, with possible application to libraries as well. Cronin gave an excellent introduction to the altmetrics sessions with a presentation titled "Beethoven vs. Bieber: on the meaningfulness of (alt)metrics". One of the conclusions was that a temporary buzz is often wrongly interpreted as an indicator of high quality or even as an indicator of a deeper social impact. Cronin suggests that altmetrics, and even citation metrics, can be used as indicators for career guidance and motivating employees, but not as factors for determining levels of salary. The reason for this is that such metrics are not perfectly valid and reliable measures of a person's work efficiency. Nevertheless, metrics are very useful indicators when used appropriately. Another interesting point made was that the Internet profiles of scientists and real time citation graphs are feeding their narcissism. It wasn't mentioned in the talk, but on the other hand, a moderate use of such Internet profiles can be good for a healthy self-actualization. Invited speaker Paul Wouters (Centre for Science and Technology Studies, Netherlands) presented a research project, "Academic careers understood through measurements and norms", abbreviated "acumen". The metric acumen includes both bibliometrics and webometrics data sources, but also uses a narrative that presents self-perspective and highlights achievements, ambitions and interests of a researcher. The acumen instrument is expected to be useful in career planning and for empowering researchers in the processes of evaluation. The question remains whether it will actually be used among the wider scientific community, especially because many researchers don't have the time or desire to deal with self-reflection and self-evaluation in addition to their regular work. Primoz Južnič, Polona Vilar and Tomaž Bartol (University of Ljubljana, Slovenia) presented research results indicating that researchers from the humanities are in favour of using the data on number of downloads, and as expected, they usually oppose the use of citation data. Most of Slovenian researchers at least partly agreed that evaluation of research results should use social network tools. Invited speaker Cassidy Sugimoto (Indiana University, USA) in her presentation titled "The metric menagerie: Tweets, Likes, and other social media metrics in the library" pointed out that altmetrics should not be an alternative to citation metrics but something beyond that. She also urged the scientific community to think critically about altmetrics and all metrics  and ask: Are they measuring objectives? Do they serve to improve the public good? Are these truly measures of social impact? At the end of the session, invited speaker Marija Brajdic Vuković (University of Zagreb, Croatia) talked about the problems of Croatian science in a presentation titled "Challenges of globalized evaluation practices in the context of semi-peripheral and localized knowledge production". She discussed how the scientific community is warning about the consequences that the coming "international twist" will have for Croatian society and culture, Croatian as a language of science, and the Croatian scientific journals and publishers. Presented papers and discussions often highlighted the importance of taking into account the different features of various fields of research. An idea that arose in multiple talks is that reducing data into one single measure is missing the point. Having multiple indicators, including the advancement of altmetrics, is important not as a substitute for citation metrics, but as something beyond that. That "something" is wider social impact and more useful outcomes. The two themes of the conference  qualitative methods and altmetrics  both require valid measurement of outcomes and impact indicators. Therefore, some speakers highlighted the importance of precise operationalization of various indicators and strict rules of scientific methodology. The topic of social media use in libraries was lightly covered in the paper presentations, but the poster session filled this gap. The conference met its goals in the way that it offered answers to many questions on how to assess libraries, users, and use, and how to assess and properly interpret scholarly contributions. Maybe even more significantly, it also raised important new questions on measuring outcomes of library use and scholarly work. Furthermore, a valuable goal of LIDA is to connect information science researchers, and that goal was certainly achieved. Further information on this 13th LIDA, including links to all presentations and papers, can be found at the conference website. The LIDA 2016 will once again bring together researchers, educators, and practitioners from all over the world in a forum for personal exchanges, discussions, and learning, in the enchanting and spectacularly beautiful city of Zadar, on the shore of the Adriatic Sea. Darko Lacović is a teaching and research assistant at Department of Information Sciences, Faculty of Humanities and Social Sciences in Osijek and a doctoral student at the University of Zadar (Croatia). His main research interests include human information behavior, and library services for socially excluded persons. He has published in peer-reviewed journals such as Croatian Librarians Herald, Libri and New Library World. Mate Juric has been a research assistant at the Department of Information Sciences at the University of Zadar since July 2011. His former occupation was as Psychologist in a Primary School. Since September 2012 he has been enrolled in the PhD study programme of 'Knowledge Society and Information Transfer'. His teaching and research interests include cognitive science, research methods, statistical analysis, and user studies in library and information sciences.